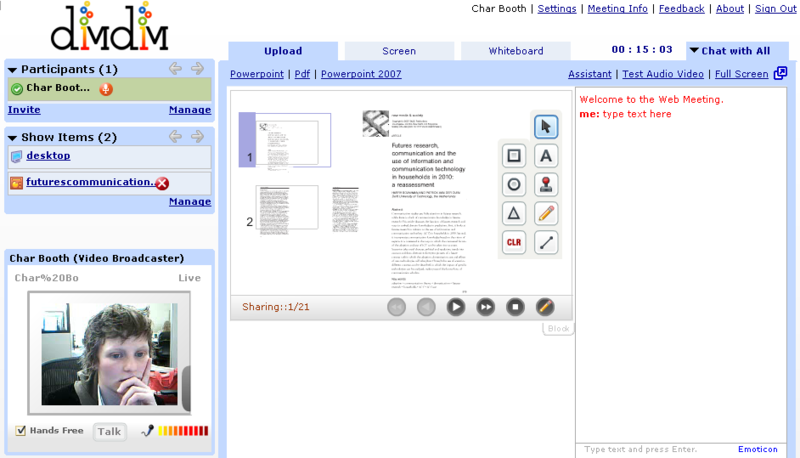 I’ve been testing out a web-based videoconferencing tool that approximates the features and functionality of Adobe Connect (formerly known as Macromedia Breeze) – DimDim is freely available via the web or through an open source platform. Not having quite enough time (yet) to mess around with the open source version, my experience thus far has been limited to the online version (also free). When I submitted my initial request for a user account it took quite a while for them to respond, fyi. DimDim allows web conferencing with simultaneous video and text communication, features desktop sharing capability in addition to .pdf or .ppt upload/visual sharing, and also features a whiteboard option. Joining a session requires no software download on the part of the user or instructor (one of its best features). There are some hefty system compatibility requirements, which DimDim automatically scans for you and makes recommendations if you require any plugins, etc. DimDim works pretty well in Firefox, and seems to be only slightly more reliable in Explorer. What it currently lacks is the ability to effectively share streaming video, which is one of the areas in which the Adobe product excels. Also, although students can see the instructor via video the reverse is not true, making it difficult to gauge the reaction of your audience unless they check in via chat. I found that once uploaded, PowerPoint files are rendered somewhat erratically, making some fonts appear Atari-ish in an unpleasant way. Pdfs look great, however. I’m investigating this as a means of providing distance instruction to a group of Master’s of Education students in Ghana as a part of my Instructional Technology degree, which should be super interesting – here’s an image of a Skype conversation with the cohort earlier this year. I’ll report on the project as it progresses this Spring. 1. Web site says Open source has all features that their selling Enterprise version has (not true) Not all respondents get their email. Email is configured to correct MX live Mail server and the Open source is limited to only 5 participants, 2 hours max meeting and only 1 meeting room. so you can’t have other meetings at the same time in other rooms. Can’t do much with that as an Open Source. I was disappointed. The Interface and look is great but you can’t always judge a book by its cover…..
thanks for your input on the os version, brian – i’ve yet to try it myself. it seems like they’re continuing development, so hopefully some of these bugs will be addressed.